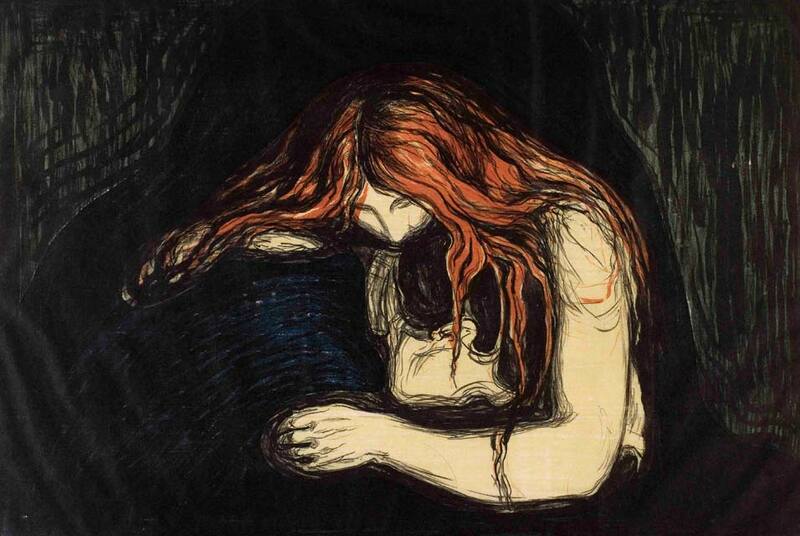 Edvard Munch, Vampire, 1895 (1902), lithograph. TEL AVIV.- The Munch Museum in Oslo holds quite a few photographs to which Edvard Munch (19441863), an amateur photographer himself, had added a meditative annotation. A Christmas greeting card Munch sent in December 1908 to his close friend, Danish poet Emanuel Goldstein, shows a ski jumperan image that was already quite common in tourist resort postcards. Munch's drawinga light, rather amused scribbleequips the jumper with a palette, paint brushes and a flapping bag, thus identifying him as a painter and charging the greeting card with the severity of a binding declaration. The image of the gliding artist brings to mind Yves Klein's well-known photomontage Le Saut dans le Vide (Leap into the Void, 1960), in which Klein declared his ability, as an artist, to leap into the etheric realm, and which was widely distributed (as a reproduction) with the newspaper France Soir's Sunday Supplement (27 November 1960) and in fliers handed out by Klein himself. As far as we know, Munch sent the jumping artist image only to two people, who knew how to extract from him the desirable saying. The addressee of a similar drawing, on the same photographic surface, was art collector and historian Gustav Shiefler (18571935), who followed Munch's work and documented his prints in a two-volume catalogue raisonné (1906, 1927). Identifying the jumper as a painter transfers the sporting ski jump to symbolic realms and characterizes it as art's "leap of faith." The postcard is therefore perceived as pointing at the ethical principle that views the artist as one projecting himself to the space of creativity, above the spectators and above nature, in order to initiate a change in life and charge it with meaning. Munch's work in print spans over fifty years (18941944), almost the total period of his work. Qualitatively and quantitatively, it exists as an independent unit, unique in its technically experimental approach, although its substance derives from the heart of his work and its images are very close, at times identical to those of his paintings. Munch's intensive interest in the various methods of print may attest to his interest in the medium's unique processes, but he is also known to have ascribed no less importance to its distribution prospects. Munch's 150 prints in the Museum collection were a gift from Charles and Evelyn Kramer, New York (1985). This collection unit was presented fully in 1990, in an exhibition curated by Edna Moshenson and documented in a comprehensive catalogue. The present exhibition re-convenes an acquaintance with familiar images, through a gaze focusing on a limited number of themes and motifs central to Munch's work. The exhibition draws additional gazes to the examination of Munch's work: those of Munch's contemporary artists, who dealt with similar motifs and may have even echoed his works in theirs; and gazes and verbal impressions of the Israeli artists Orit Hofshi, Michal Heiman and Shai Zurim, who have integrated references to Munch's images into their work. Munch, who sought to "paint life as it is," used description and symbolization as his two channels of utterance. Documenting his observation of objects (himself, his acquaintances and his social surroundings) and conceptualizing them as symbolic images of existence are submerged into the vitality of emotion, in a whole range of feelings and insights that represent a total life experience. This trembling testimony of experience's throbbing moments seeks to replace the conventional utterance frames of the bourgeoisie, which excludes art to realms of beauty, harmony and unity, forcing it into the stocks of the "right and proper." ] [and] to help others to clarify their lives," demanded the phrasing of an image that would tell the life of the soul yet be discerned as its own entity, convening its experience to others. This intent, as well as the diligent dissemination of the images through the medium of print, are the directions towards which Munch developed Jaeger's unique theory. The mission to stimulate art's nerves and result in a better transmission of the immediate and the real enhanced in Munch the sense of living and working "on the edge," or, in his words: "I stagger about amidst life that is alive." The world was waiting for him outside, indifferent as ever to the torment of inner life. The difficulty arising from his images stems therefore from Munch's contact with the world and with others ("Hell is other people," said Sartre), mainly women, who in Munch's work exhibit the gap between the outside world and the individual and social realms of darkness. Occasionally women appear in iconographic contexts of gentleness, love and devotionbut the Munchian woman is mostly identified with images of Madonna and vampire, whose presence in his work was enhanced during his ongoing vicissitudinous affair with the upper-class liberated Tulla Larsen. These images echo Munch's attitude to women's suffrage or "emancipation" (mentioned in his diaries)one of the late-19th and early 20th century European modern developments. Munch's perception of the liberated woman as rebelling against nature and her own nature, and threatening the right (patriarchal) order, much as it grates on contemporary ears, was not unique to himnor is her comparison with a vampire, i.e. the ultimate Other that contaminates all who come into contact with it. Such images appear in the poetry of Goethe ("The Bride of Corinth," 1797), John Keats ("La Belle Dame Sans Merci," 1820) and Charles Baudelaire ("The Vampire's Metamorphoses," 1857), as well as in Bram Stoker's Dracula (1897), which portrays the sexual awakening of women seduced by a vampire. Fatal women are also prevalent in the plastic art of Munch's contemporaries (see the works of Alfred Kubin and Willy Jaeckel in the exhibition). The discussion of Munch's work was, until recently, inseparably linked with his biography. The childhood and adolescence traumasthe death of his mother and sister, the mental breakdowns, the drinking, the women in his life and the years of solitude following his recoveryall tightly framed the reference to his art. In recent decades, writing about Munch tends to focus on the iconic character of his images, whose directness seems to make words redundant, and on his practice as an artist. In this context, one may discern the repetitionthe sequential and serial recurrence of motifs as one of the salient characteristics of his work. Not one of Munch's constitutive works remained a unique exemplar, for he would paint and repaint the paintings that had been lost or bought. Certain motifs were repetitively painted in variations for the sake of delving and updating; others were copied for use in different contexts or were translated into another medium, e.g. print. Observation of the motifs expressed in paintings in their detailed repetition in the various printing techniques enhances awareness to the replicating character of Munch's work. It seems that the constant return to those motifs, rather than being forced and cathartic, serves as a strategic process seeking to capture existence from within existence, that is: formalize as an image (an act that is a summary of sorts) that which cannot be summarized. For Munch, the image is the object itself as it is experienced at a given moment, and as such is an object for the artist to examine and re-examine together with his own recurring response, while updating it on the changing circumstances and contexts. Repetition, which in any case characterizes formalizations as an interim summary, enabled Munch to re-invent himself through rejuvenating the intensity of feelings eroded by the ravages of time. In retrospect, it seems that the recurring repetitions and reproductions in his work indeed released Munch's motifs from their subjective context, making them into emblems that enable recurring use in different contexts. As such emblematic "brands," Munch's imagesThe Scream, Self-Portrait with a Skeleton Arm, Brooch, Eva Mudocci (Madonna)were woven into Andy Warhol's silkscreen prints. In Warhol's case it was a commissioned work that was not printed as a full series; nevertheless, the very appearance of Munch's images in Warhol's work attests to their status as icons, appropriated by others, too: Jasper Johns, Georg Baselitz, Tracey Emin, Gilbert & Georgeto name but a few random names from among countless artists whose awareness of the artificial led their gaze to the images of existential intimacy formulated by the 19th-century modernist, confident in their power to make a change and give a meaning to life.